Alberto Machado (21-1, 17 KOs) was expected to make a statement against Andrew Cancio (20-4-2, 15 KOs) but things didn’t go according to plan. The post What’s Next For Former Champion Alberto Machado? appeared first on Round By Round Boxing. 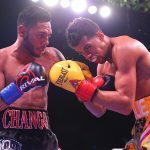 NextWhat’s Next for New Champion Andrew Cancio?